Bruxie Gourmet Waffle Sandwiches are definitely bold, and I would have to add, exciting, unique, fun and overall DELICIOUS! You’ve never had anything like Bruxie, a Bruxie, I guarantee it. 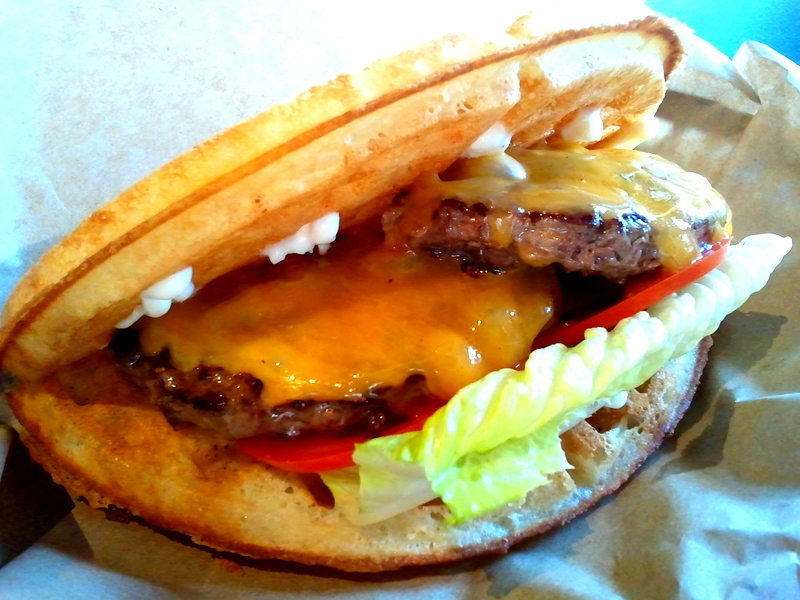 When you hear that it’s a waffle sandwich, ya think, yeah whatever, how special can that be. Believe me, it is as special as it gets. 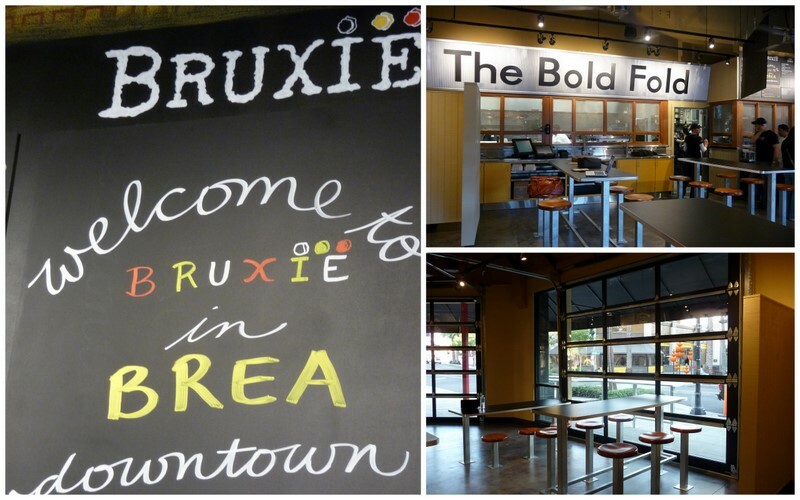 So what is a Bruxie? It’s a sandwich, of many types, that instead of the age old slices of bread, bun, roll or baguette, it is a gorgeously tender thin round Belgian waffle (folded in half) with just the hint of a tooth ‘crunch-against’ outer crust, pushing into the utmost tenderness within. It is not a sweet waffle but yeasty like fresh baked bread. The waffle holds it’s own againts numerous fillings, meaning it won’t get mushy and dissinigrate or crack under the pressure. This is amazingly delicious stuff. 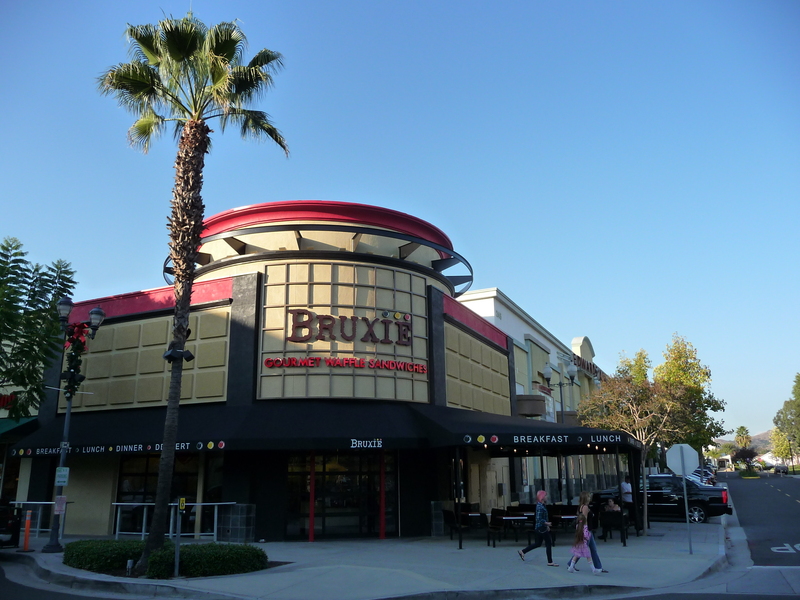 The newest (and second location) to get your Brux-on is the just opened Downtown Brea location on the quaint Birch Street Promenade. It is a fun location built on the idea of the original in Old Town Orange that took over an old 50’s gas station. By fun, I refer to the auto garage setting, right down to the two glass garage doors that are rolled all the way up, that invites you to stroll right in, or out with your Bruxies, to sit outside on the covered patio or railings lined with chrome barstool that stands outside along the sidewalk. 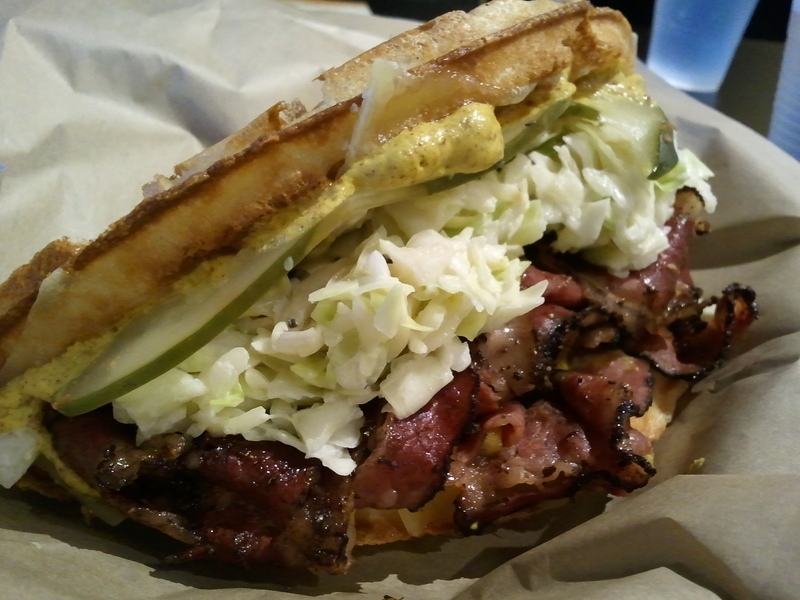 The above is by far my favorite of all the Bruxies I have tried so far: The Hot Pastrami Bruxie (Boar’s Head Pastrami with Gruyere, Cider Slaw, Spicy Brown Mustard & Half Sour Pickles). Just typing that line makes my mouth water! The pastrami is juicily moist and quickly griddled to apply a slight crispy crust to the meat. The entire experience is hot, juicy, salty, tangy, crunchy and spicy. Oh my, it is just so good . Bruxie also offers locally produced Old Fashioned ‘Pure Cane Sugar’ Sodas. The two pictured above with the pastrami are the Vanilla Cream. It is so light and refreshing, not cloyingly sticky on the tongue and overly sweet like most cream sodas. The Bruxie Burger is an Angus Beef Patty, cooked to a perfect medium that retains all it’s lovely juicyness. Topped with the requisite cheddar cheese, mayo, tomato and lettuce. 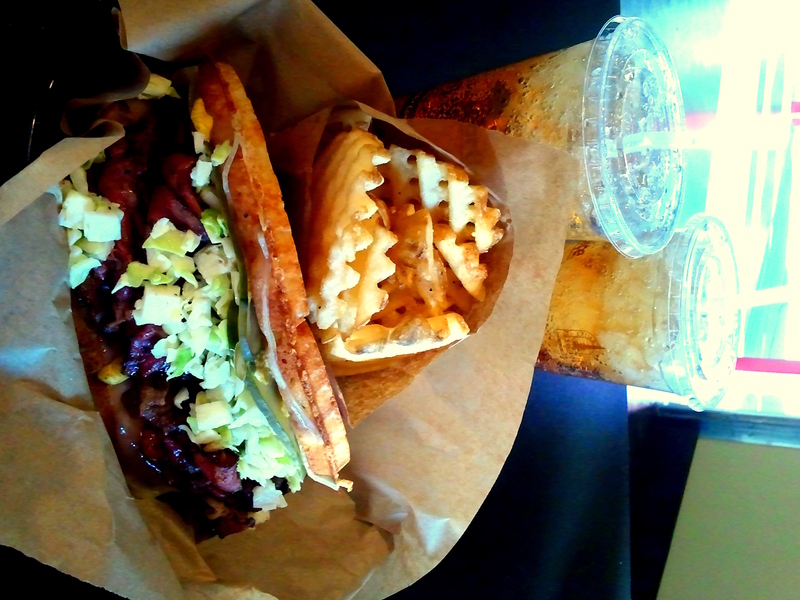 The Bruxie waffle works very well here. I was afraid it wouldn’t, but it really does. The Carolina BBQ Pulled Pork (slow roasted pork, cheddar cheese, cide slaw & their own Bruxie BBQ sauce) is juicy and tender topped with a nice sauce that compliments the pork. 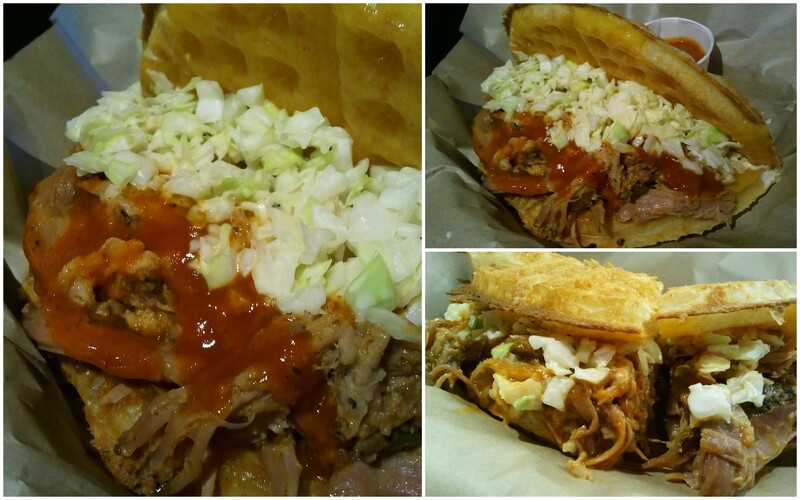 It gets a little messy here as the pulled pork and sauce is damp and if not eaten in a timely manner, it will soak through the waffle (though it is so worth it). 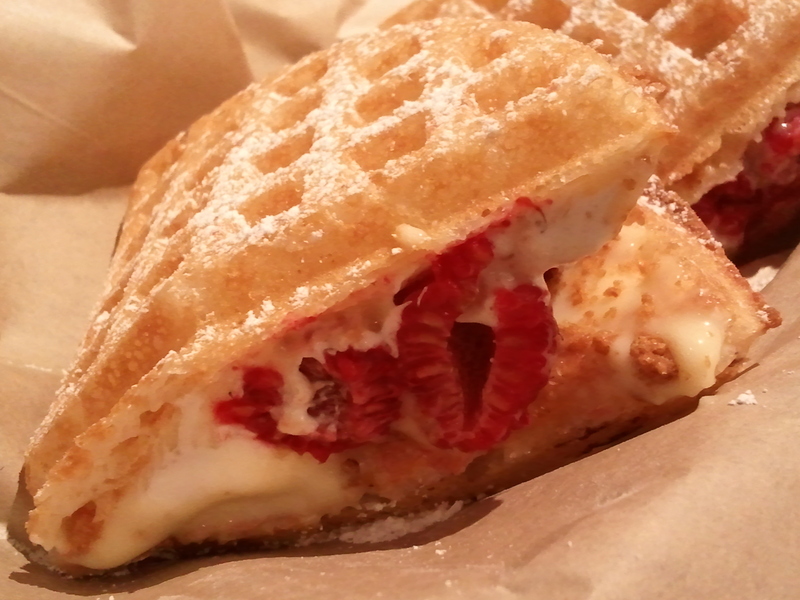 Now not only does Bruxie Waffles do gourmet sandwiches well. They do salads equally as well. 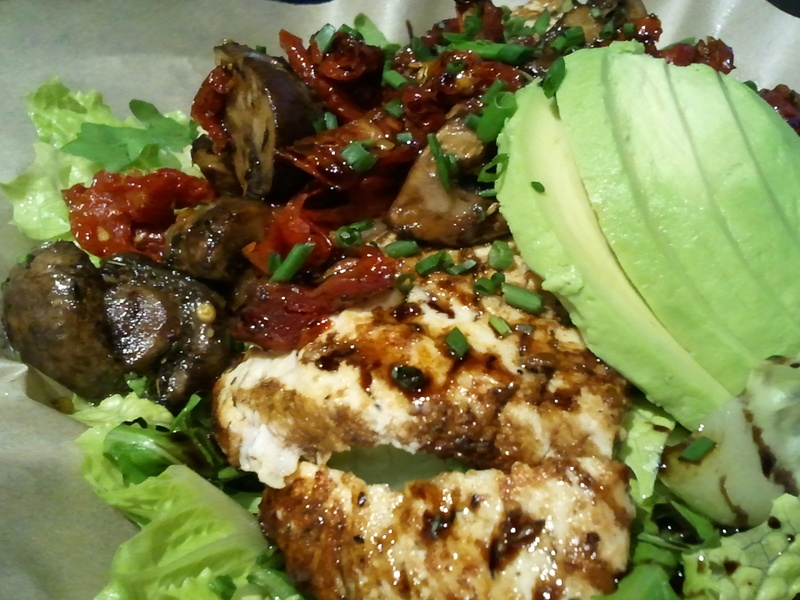 The Bruxie Salad (grilled chicken on romaine & arugula, topped with roasted mushrooms, sun-dried tomatoes and avocado in a lemon vinaigrette & balsamic reduction) is a salad to end all other salads. It is so amazingly flavorful…flavor that fills your mouth and imprints a memory of complete deliciousness you won’t soon forget. The flavors are big, bold and robust as well as tart, tangy and bright. The chicken is grilled to perfection, slightly charred, tender and moist. A perfect salad. 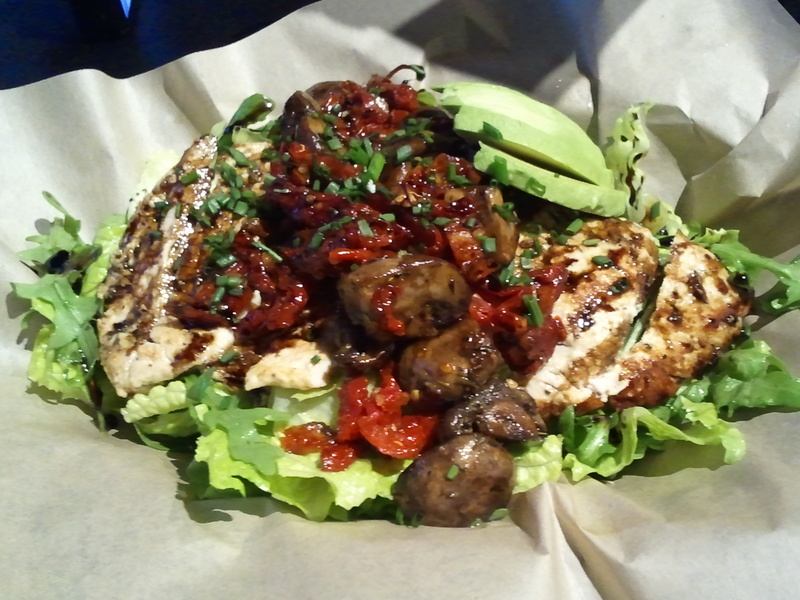 Another good salad they offer is the Grilled Chicken Caesar. 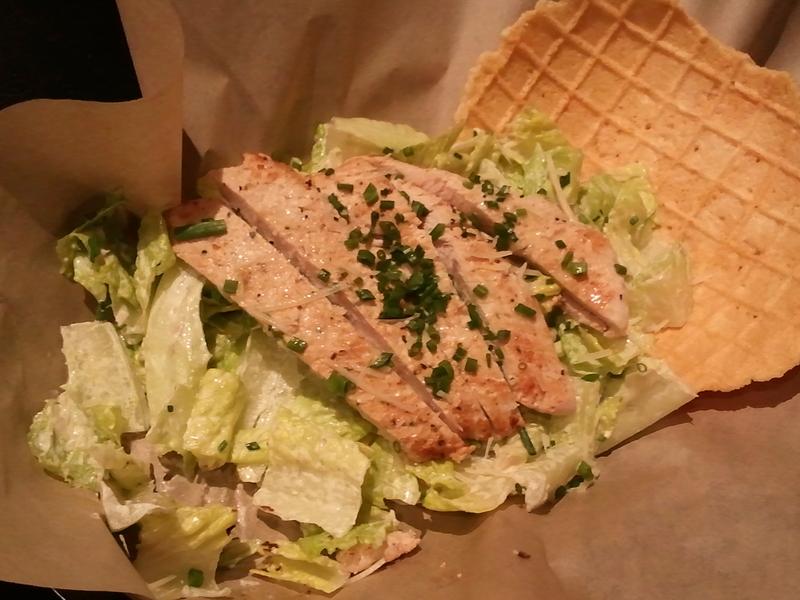 A solid and delicious caesar though what stands way out is the giant parmesan waffle crisp that accompanies it. The entire crisp is parmesan!! Oh so good. You can break it up and sprinkle it over like croutons or use it like a tortilla chip and pile your perfect bite on a broken off piece to eat. I could devour just the crisp alone. 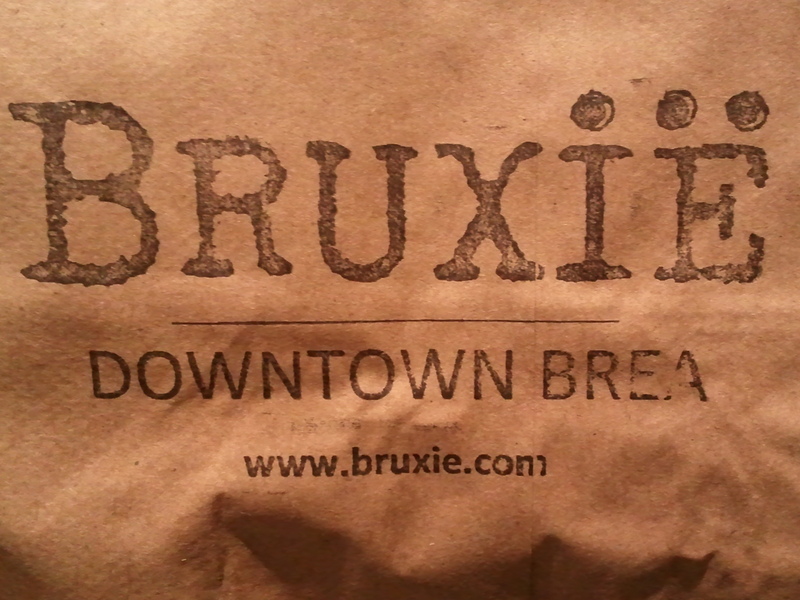 Let’s hope Bruxie eventually sells just the crisp by the bag full. 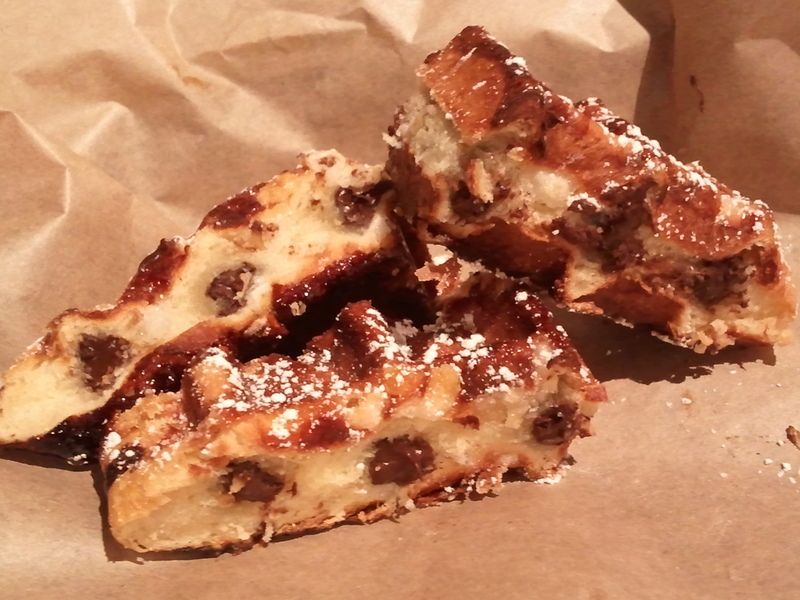 Now for the sweets, and boy do they get sweet and crazy good. The Lemon Meringue Bruxie with raspberries is just ooey gooey sweet tarty goodness. A classic and delicious combination. This complete surprise and amazing thing of a waffle. Your eyes do not decieve you. Yes, that is chocolate floating perfectly INSIDE a waffle. No need to drizzle it over the top, Bruxie stuffs it in. 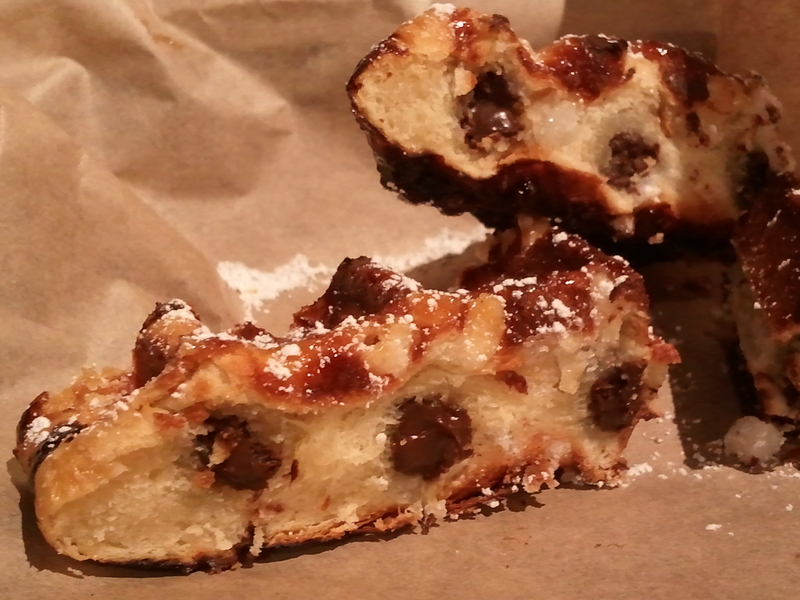 The Chocolate-Filled Liege Waffle (with carmelized pearl sugar, dark Belgian chocolate stuffed) is an amazing thing to behold, let alone eat. The Liege waffle is fluffy, dense and tender. By being gently sweet, it allows the dark Belgian chocolate to truly be a featured suprise. I’m not sure how they get the chocolate in there but I suspect they have narrow ‘rods’ of the dark chocolate they push into the just poured Liege batter. While enjoying this perfect dessert, I noticed the chocolate on the outter edges was melty goodness while the chocolate closer to center had a bit more ‘al dente’ chew to it. Just awesome. Bruxie Gourmet Waffle Sandwiches is so unique and not just in the food. Both locations, in Brea and Old Town Orange, are fun to be at and you feel comfortable to just hang out. What is truly exceptional is the quality of service Bruxie’s staff offers. I have never met a nicer or more friendly staff. Every one of them have genuine smiles on their faces and sincere demeaners. They are eager to help you in any way and truly are happy when you are happy. We must go back for the pastrami. Soon. Yes, lets! The thought alone makes me salivate. Plus I need to try their new seasonal Egg Nog Shake.